Following the Treaty of Paris, the end of the Saint-Nicolas plateau now delimits the border 10 kilometres (6.2 mi) below the Mont Cenis pass. The France–Italy border is the international boundary between France and Italy. The Franco-Italian border is 515 kilometres (320 mi) long, southeast of France and northwest Italy. It begins at the west tripoint France–Italy–Switzerland (45°55′23″N 07°02′40″E﻿ / ﻿45.92306°N 7.04444°E﻿ / 45.92306; 7.04444) at the top of Mont Dolent (3,820 m), in the French commune of Chamonix (department of Haute-Savoie), the Italian city of Courmayeur, (Aosta Valley) and the Swiss commune of Orsières (canton of Valais). The boundary then follows a general direction towards south, to the Mediterranean, it reaches the sea at Menton in France and Ventimiglia in Italy. The border separates three regions (Aosta Valley, Piedmont, and Liguria) and four Provinces of Italy of Italy (Aosta, Turin, Cuneo, and Imperia) from two regions (Auvergne-Rhône-Alpes and Provence-Alpes-Côte d'Azur) and five departments of France (Haute-Savoie, Savoie, Hautes-Alpes, Alpes-de-Haute-Provence, and Alpes-Maritimes). 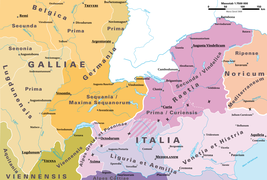 Partition of the Western Alps between the provinces of Gaul and Italy in Roman Empire. The Var river border between Gaul and Italy in Roman Empire. Border between France and the Italian states in 1700. English map representing the North West Regions of Italy (Kingdom of Sardinia, Duchy of Milan, Republic of Genoa) and the border with France in the 18th century. Changes of borders with Nice and Savoy annexed by France in 1860. The border between the two countries dates back to that separating the Kingdom of Sardinia and France during the 19th century. In 1860, the Treaty of Turin links the Savoy and County of Nice to France; the accuracy of the border between the French Empire and the Kingdom of Sardinia is carried out the following year. When World War II came out, Italy claims and administrates a territory in the date of armistice of 24 June 1940 (Franco-Italian armistice signed at the Incisa villa near Rome) and then extended from 11 November 1942. The Germans occupied the Italian zone from 1943, and the territory was finally liberated by France in 1944. The border is changed by the Treaty of Paris in 1947, when France Schedule including Tende, La Brigue, Mont Chaberton and the Lake of Mont Cenis. From the perspective of the Italian diplomacy, in the early 21st century a point still to be solved concerning the demarcation of the border at the top of Mont Blanc. ^  Directorate General for Europe, Ministry of Foreign Italian case describing its action programme for 2001, p. 5.